My name is Denis Williams and I am a DIO project manager. 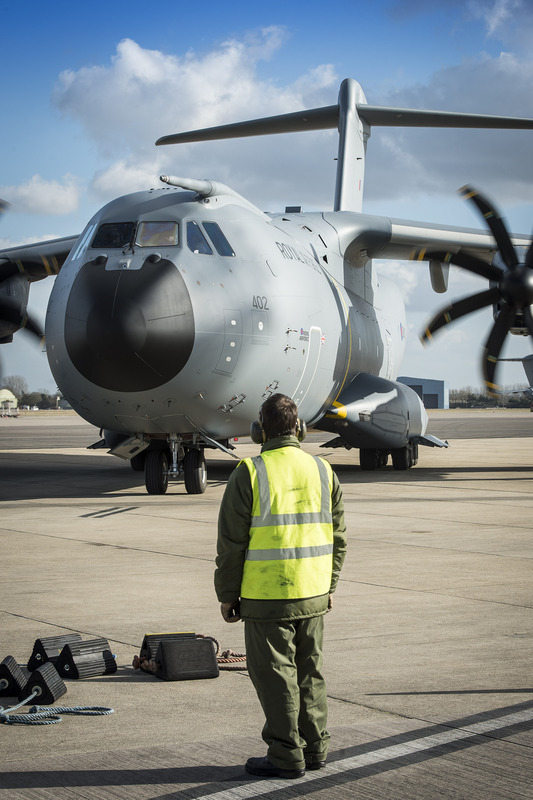 Currently I’m working on a project to support the Airbus A400M aircraft which the Royal Air Force has recently stationed at RAF Brize Norton. The first arrived in October last year and the last of the 22 ordered by the RAF is scheduled to arrive in 2019. They will be operated by 70 Squadron, which will be the first of two squadrons to operate the aircraft. 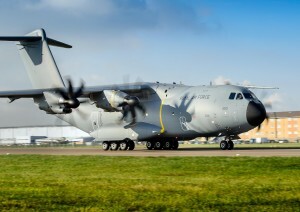 Also known as Atlas, the A400M is capable of carrying a load of 25 tonnes for over 2,000 nautical miles and will be the mainstay of the RAF’s tactical transport fleet. The interior can be configured for various loads, including carrying military vehicles or helicopters, equipment or purely for transporting personnel. The Atlas planes use components from UK, France, Germany, Italy, Spain, Belgium, South Africa and Luxembourg, to replace its C130J Hercules transport aircraft. The Atlas can fly almost twice as fast, twice as far and carry almost twice as much cargo as its predecessor. With a length of just over 45 metres and a wingspan of nearly 42.5 metres, these planes are sizable. As you might imagine, then, they require a large hangar and that’s where I come in. The hangar is not intended to house the aircraft permanently, but is an area where maintenance, repair and overhauls can take place under cover. A significant amount of work was required to prepare the area where we planned to build the hangar. The proposed site was home to a colony of great crested newts, which are a protected species. This meant working with DIO’s ecologists and Natural England to ensure that the newts were carefully and safely relocated to conservation sites elsewhere at RAF Brize Norton. We also had to install emergency water storage tanks, level and remediate the site and divert underground water pipes and electricity and communications cables. This work was completed in March this year at a cost of around £14 million. 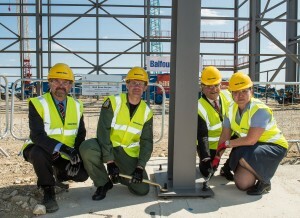 Working with our contractor Balfour Beatty and sub-contractor Billingtons Steel, we’ve recently begun installing the steelwork frame of a new hangar and office building. The primary trusses are ten metres deep and weigh 90 tonnes each! They had to be lifted into place using two 168 tonne cranes. The hangar will have three bays, gantry cranes, an aircraft ground equipment store, forward support stores including engine and tyre bays and a three-story office/amenities block. This phase of the project is due to be completed in May 2016 and will cost £42 million. The final stage will be the internal fit-out which will be completed by Airbus and our colleagues at Defence Equipment and Support. 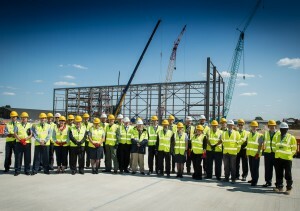 The work is progressing well and I expect that the steel framework will be complete by the end of September. As with any construction project, there have been occasional delays which are only to be expected. We’ve lost some days to windy weather and others to avoid conducting noisy and distracting work while victims of the Tunisian terror attack were being repatriated to RAF Brize Norton. Nobody objects to showing whatever consideration and sensitivity we can in those awful circumstances and the steelworkers have been great, putting in extra hours to catch up so we’re ready for the bricklayers on schedule. 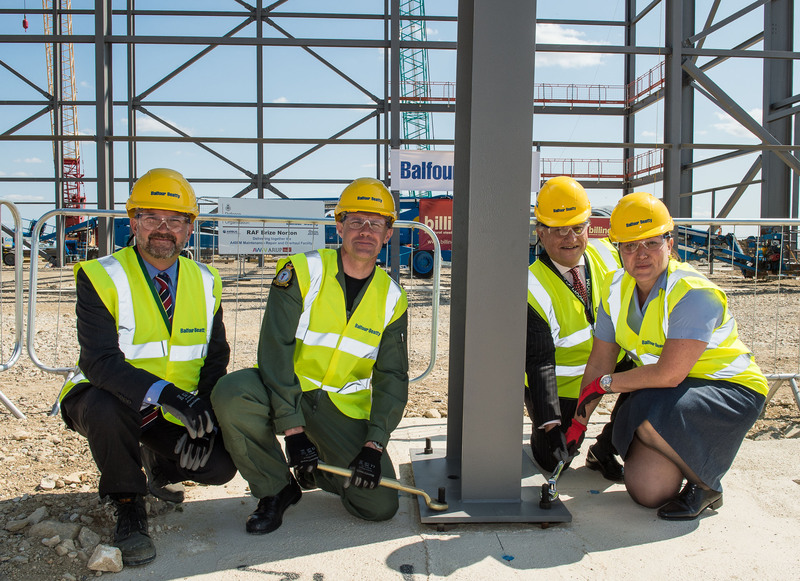 Of course, RAF Brize Norton is a large and very much operational airbase, so we’ve had to work hard with our partners to make sure that the work doesn’t interfere with the Royal Air Force. This has meant regular conversations and meetings with colleagues in DIO, the RAF, Defence Equipment and Support, Airbus and our contractors. 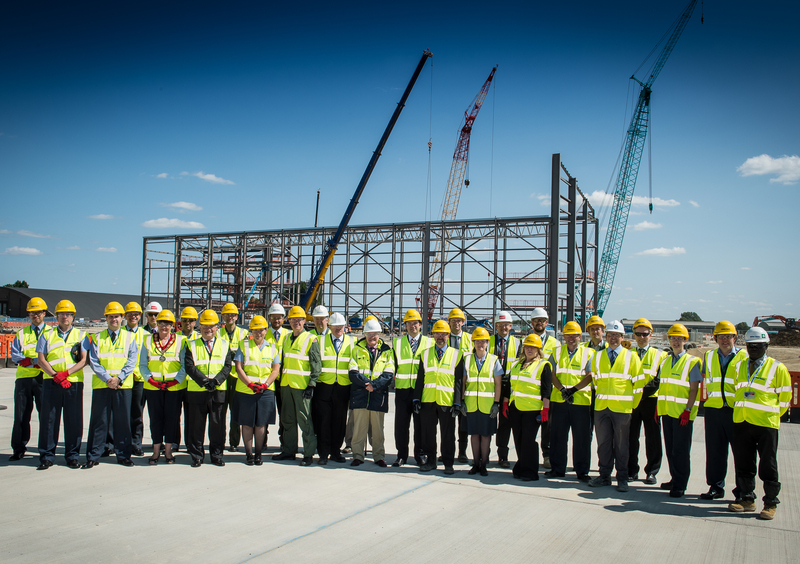 Once complete, the hangar will cover an area of 24,000m² and will use 3200 tonnes of steel. 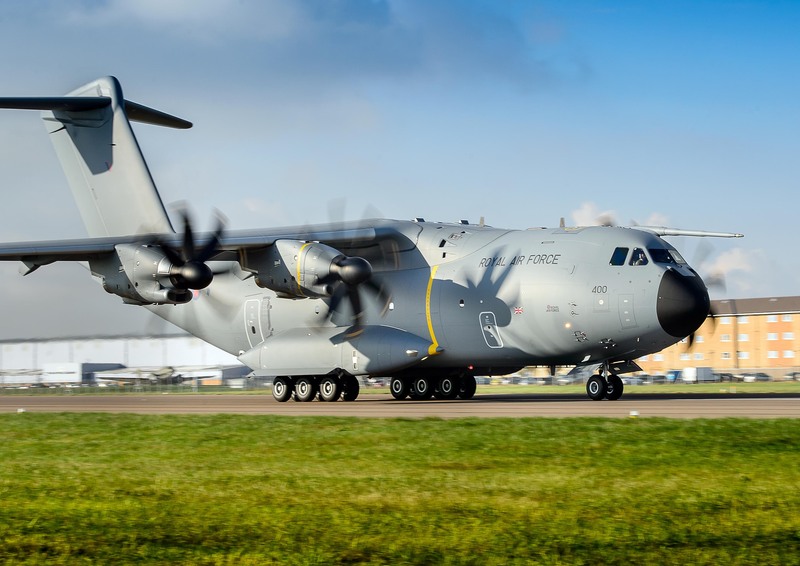 It won’t just house the A400M as it’s also designed to be able to service other large RAF aircraft – the C17 Globemaster, which is used for transporting freight, and the A330 Voyager, which are a personnel carrier and an air tanker. It will be an impressive sight and I’m sure the RAF pilots and technicians will find that it’s a high-quality facility which really meets their needs.